This CD was issued to commemorate the 50th anniversary of Bairstow's death in 1946. 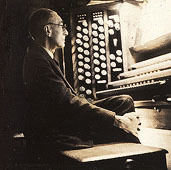 He was organist of York Minster from 1913 to 1946. A composer of the highest calibre, his choral and organ music are still much in use today. Bairstow was one of this country's leading musicians of the inter-war years and these recordings show the variety of his work as an all round musician. The disc concludes with a spoken tribute to Bairstow by his most eminent pupil, Dr Francis Jackson, his successor as organist of York Minster. Bairstow: Prelude in C. Performed by the composer, York Minster. Rec. 30/11/45. From acetate disc of his final B.B.C. radio broadcast. Gibbons: O clap your hands. Gibbons: O Lord increase my faith. Bach: Prelude and Fugue in B minor & Chorale Prelude - O, come Saviour of the world. Excepts from Bach's Mass in B minor. Recorded during an actual performance at the Royal Albert Hall, London, 24th April 1926. The Royal Choral Society & The Royal Albert Hall Orchestra. Conducted by Dr. Edward C. Bairstow. Gloria in Excelsis. Qui tollis. Patrem Omnipotentem. Crucifixus. Sanctus. Hosanna in excelsis. Edouard Silas: Fantasia & Fugue in E minor, Rec. 1945 & 1996 York Minster. i) Fantasia played by Bairstow as track 1. Rec. 30/11/45. ii) Fugue played by Francis Jackson. Rec. 15/3/96. Speech about Bairstow by Francis Jackson Recorded York Minster, 15/3/96. It was a wise decision taken by the Chapter of York Minster in 1913 to appoint Dr Edward Cuthbert Bairstow to the post of Master of the Music in succession to Thomas Tertius Noble. Precisely how wise was yet to be revealed. Bairstow was then 38 and, as organist of Leeds Parish Church and, before that, of Wigan Parish Church, he was already building up a formidable reputation as organist, writer, composer, choir trainer, adjudicator and teacher. Thus began an association which lasted for 33 years, during which the music of York Minster reached as high a pitch as, perhaps, it is ever likely to attain. The choir became world famous and Bairstow became one of the top cathedral organists, which, in the inter-war years, meant one of the top musicians of the country in any field of music. He became a potent force in the country's music along with such men as Vaughan Williams, Bantock, Stanley Marchant, Dent, Percy Scholes, Holst, all of whom were faced with a national situation, so far as music was concerned, which was very different from that which the country enjoys at the present time. Indeed Bairstow's whole life was dedicated to the furtherance of music for the masses, to the raising of the standard of performance and to the improving of the lot of musicians of every kind. He was often quoted in the national press when speaking in his adjudications or presidential addresses, and his manner of delivering these utterances was such as to draw attention to them. His punches were never pulled. Over and over again he mentions the plight into which he saw music descending because of the poor state of the economics, the 'poisonous materialism' he discerned on all sides and,during the 1930s, the mechanisation of music, and the rise of broadcasting and canned music. The wireless, he thought, was emptying the concert halls and a great number of choral societies were being forced to close down due to lack of support. These opinions drew forth a leading article from the editor of The Listener who took him to task for his strictures on broadcasting. His fears were very real, and understandable, for it seemed that all things were conspiring against his cherished dream of the universal spread of individual participation in music towards the reach of all men, women and children. One is tempted to suppose that, had he been alive during the last 50 years or so, he might have seen his fears to be largely groundless in view of the firm place which music of every sort has in the life of the nation, and that the very means that he thought were menacing its spread and development; though what he would have said about the poisonous materialism at this moment doesn't bear thinking about. Had he seen the veritable welter of the gramophone records, tape recorders, cassettes, CDs and all the sophisticated methods of sound production, would he not rather have rejoiced that at last his dream was being realised. The professor of music must only have been glad that his students were able to hear the music they were studying, no matter from what century, rather than having to recreate it themselves in their mind's ear from cold. Yet I suppose he could have considered it a mixed blessing. To come by something too easily, or to deprive the imagination of exercising its function would, I am sure, have seemed wrong to him. I remember very clearly how annoyed he was to receive a picture post card of the mill reputed to have inspired Müller and Schubert to produce Die Schone Müllerin. He had built up a mental picture of the scene which was far more beautiful than the postcard, and this had quite shattered it for ever. It was this point of view that caused me in recent years to forgo seeing the television films of the lives of Elgar and Delius in which an actor plays the part of the composer. From this example you will see something of the effect of his personality on others. That such a trifling incident should have made a lasting impression on me was due to the way he projected his thoughts and couched them in words one could understand immediately and retain in the memory. They - the words - were few, and utterly simple. Not one was wasted, and each was exactly the right one; moreover, it was always there, on the tip of his tongue, not to be groped for and uttered in a tentative or doubtful way. It was delivered in his somewhat rasping, nasal voice - a voice which, when raised to sing a musical example for a choir's benefit, would have taxed the credulity of anyone who was expected to believe that he was a musician. Thus as a teacher he was equipped with what he described as 'that most precious gift, the "sense of message", the feeling that what you do is done for others'. He realised that he was born with it, and so he spent his life in the service of others in a variety of ways; teaching them - and there can be few teachers who could boast as many pupils through their hands as he; by playing to them, as one of the finest organist of his day; adjudicating them in what he considered a very valuable exercise, the competitive festival; conducting them in chorus, orchestra or church and cathedral choir; or in accompanying them. His organ accompaniments to the daily services were models of their kind, colourful and rhythmical, subtle, descriptive, evocative and inspiring to both choir and worshippers. This did not mean that they were without untoward incident. Indeed, it seems to me after more the 60 years that incidents happened rather too frequently, although this may be a trick of the memory. I remember, for instance, times when he was of the opinion that the choir was not going at the tempo he wanted so he increased the power of the organ - sometimes so much so as to drown us completely - which either brought us to heel or ended in chaos. By so doing he exceeded his role of accompanist, which was strange, because his method was to treat the choir as one entity, letting them get on with it and the organ as another which must fit in with the choir. Had he have been less easily roused to fury surely the most efficacious course would have been rather to reduce the power of the organ and allow the choir to do its job, which it was eminently capable of doing as trained by him, even if the performance was not exactly what he was aiming at and had fallen short of his ideal. But, as his daughter has said, and I quote, 'of course there were periods of depression; my brothers and I had to tread warily otherwise we might bring the full blast of his anger on our heads!. My mother was the stabling factor in our family; she managed to keep calm and soothe the victims and distract my father by suggesting a game of patience'. which he was fond of and used several times himself in his compositions; for instance, the Benedictus of his big Communion Service in D and in his chant for Psalm 122. It was a simple device and it appealed to his romantic nature by reason of its strangeness and beauty. 'These are the ingredients of romanticism', he said 'that which is strange and at the same time beautiful'. And, as he, too, taught in parables, and from everyday examples, he went on to explain that a Greek statue was beautiful without being strange or mysterious; that a chemical reaction was strange but had no beauty; and, somewhat unchivalroulsly, that the charwoman was neither strange nor beautiful. We find this romantic approach to perfection in the marvellous 'Let all mortal flesh keep silence' and in the final if the Six Variations for violin and piano, a master work which is quite unknown to audiences nowadays but is one which Elgar himself would not have been ashamed to own. The ending especially is very deeply felt and extremely beautiful. Beauty, in fact, was one of the main touchstones of his way of life. One day when I appeared for my lesson I was startled by a new and colourful covering for the piano. He said it had come from Libertys and he added that he was so pleased that I was able to appreciate beauty in things other than music. because the person who couldn't do so would be lacking something as a musician. There was always a lesson to be learned from any situation. His appreciation of words as vehicles for musical setting seems to have been coloured not only by their intrinsic beauty, but also by events connected with them. 'Let all mortal flesh' has just the kind of words to arouse his imagination and to bring the best out of him, with its other - worldly mysticism. This, not published until 1925 but written in 1906 - the same year as the utterly different, ebullient, earthy Evening Service in D - is one of his greatest anthems, an early glimpse of his later, more controlled style. Another just as great in a different way, came into being when he saw his vicar at Leeds, overcome by emotion during the singing of Psalm 94. The vicar, Dr Bickersteth, had had a very severe illness and was away for some months, and when the words in the psalm were reached; 'If the Lord had not helped me, it had not failed but my soul had been put to silence. But when I said my foot hath slipped, Thy mercy, O Lord, held me up', Dr Bickersteth sat down and wept. This affected Bairstow deeply and he decided in that moment to set it to music. The church compositions that are the most successful are those whose words moved and really inspired him, particularly any which had to do with mysteries. Some of his early anthems, like the one written for the opening of the Wigan organ, though well written for the singers and the organ, are inclined to be academic and rather showy though they contain foretastes of works that came later. It is most interesting to follow the growth of his style, from his earliest published works in the 1890s when he writes in the idiom current at that time, through a period of productivity lasting until the first world war, culminating in two anthem of 1916, both intensely poetical and expressive; and finally the inter-war years which give us the three introits, the splendid E flat unison Service of Matins, Communion and Evensong, the anthem 'Though I speak with the tongues of men' and the Coronation Introit, the Evening Service in G and finally the haunting Lamentation, almost his last work. This was written at the behest of Dean Milner-White, who regretted that Sir Edward was not using his composing talents sufficiently, so provided him with - so he told me - some 100 poems for possible use. Out of this came the Five Poems of the Spirit which were completed by Ernest Bullock, published posthumously, and given their first performance on 9 November 1955. From his pen came a steady stream of compositions throughout his life. Not, unfortunately, a stream in spate. That was impossible with all the other commitments. But we are fortunate that he felt the urge sufficiently to compose and leave so many fine and meaningful works for posterity. One critic,. quoted by Ernest Bradbury in the Yorkshire Post said that Bairstow stands 'head and shoulders' above his church music contemporaries as a composer of real distinction'. And it was not only in composition that he excelled. As I have said elsewhere, as an organist, choir trainer, composer, adjudicator, conductor, accompanist, writer, lecturer, and, above all, as a teacher, he was pre-eminent. His greatness lay in the fact that he never put up with anything but the best. He was absolutely sincere in everything he did and said, and never flinched from saying or doing whatever he thought to be right, no matter what the consequences might be. Some of the situations in which this attitude landed him will be handed down to future generations, no doubt with embroidery. His escapade at Port Arthur during his Canadian tour of 1928 is almost unbelievable, when he criticised two solo singers in the organ recital he was giving. He considered that the music they sang was not of a high enough standard and he did not scruple to tell the entire company assembled, full of goodwill, that he felt this to be the case. Naturally there was consternation, followed by a tea party at the Minister's house, during which not a word was spoken. But his reply to the lady who told him that she supposed he thought he had come from the old country to show them how to do it is quite in character. Unabashed he answered, 'That is what I was engaged for'. A short article cannot hope to contain everything one could say about Sir Edward. There are lots of things one has to leave out. I have not mentioned for instance, his keen sense of humour and his relish of funny stories. And there are very many stories about him and the things he said to choral societies about tenors and contraltos. Tenors seem to have be the bane of his life and once, driven to desperation, he said 'when God gave man a tenor voice he took away his brains'. Contraltos were 'like a lot of cows looking over a gate' I haven't mentioned his kindness, or his uncanny sympathetic understanding of the feelings of other people. He could be ruthless, we know, with shattering results, but he could also be infinitely subtle and gentle where that kind of approach was best. I think it would be fairly near the truth if I were to describe his life as a campaign - for the betterment of humanity through music and the other things of spiritual value. And we who knew him give thanks for the tremendous example he set in the way he approached and discharged the many facets of his life's work. The abiding affection we have for him causes us to try to pass on to others something of the benefit we have received from knowing him and though coming into contact with his attitude to music, his philosophies and his way of life. Blessed City. The life and works of Edward C. Bairstow. The first five chapters are Bairstow's own autobiographical writings.